So let’s talk about the important recipe details you need to follow to make this cheesecake dream into a REALITY. To make this easy to follow (and not too boring! ), I’ve broken down the most crucial “NEED TO KNOW” details in order of how they’ll be followed in the recipe. 1) Place your cream cheese, sour cream, and eggs out on the counter top for at least one FULL hour. This step – although easy – is extremely important. Youneed your cream cheese to be verrrrry soft so that it creams easily in your blender or food processor. You’ll want the cream cheese, sour cream, and eggs to all be at the same temperature when blending, which is why it’s ideal to set them all out at the same time. 2) Before placing your graham cracker crust in the springform pan, be sure to lightly spray the entire pan with non-stick spray. You could also lightly butter the pan if you don’t have/don’t use canned sprays. 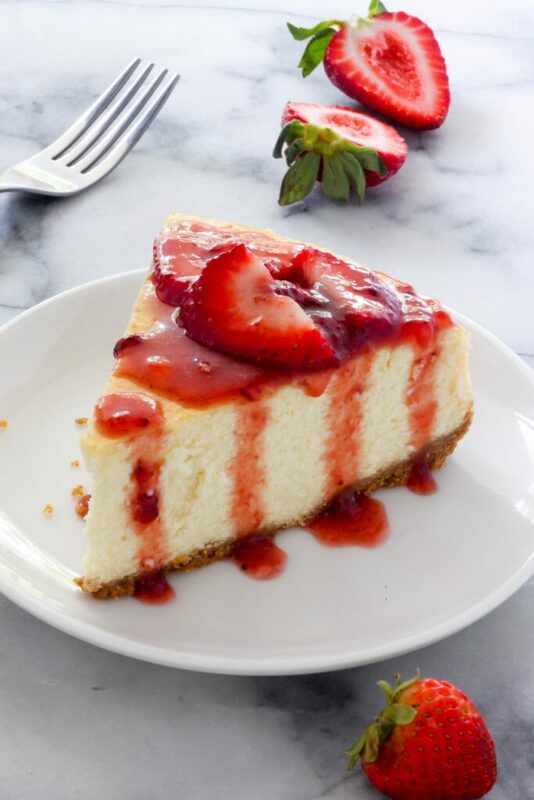 Spraying the entire pan will ensure your crust and cheesecake won’t get stuck to the pan during baking. 3) When pressing the graham cracker crust down into the bottom of the springform pan, press it down very firmly. A firmly packed crust will bake up nice and thick, and most importantly, won’t crumble too much when sliced. I recommend starting to press the crumbs down in the center of the pan, then working the crust out and just a little bit up the edges. You can use the back of a spoon to do this, or wrap your hand in a piece of plastic wrap (also known as saran wrap) and do it manually. 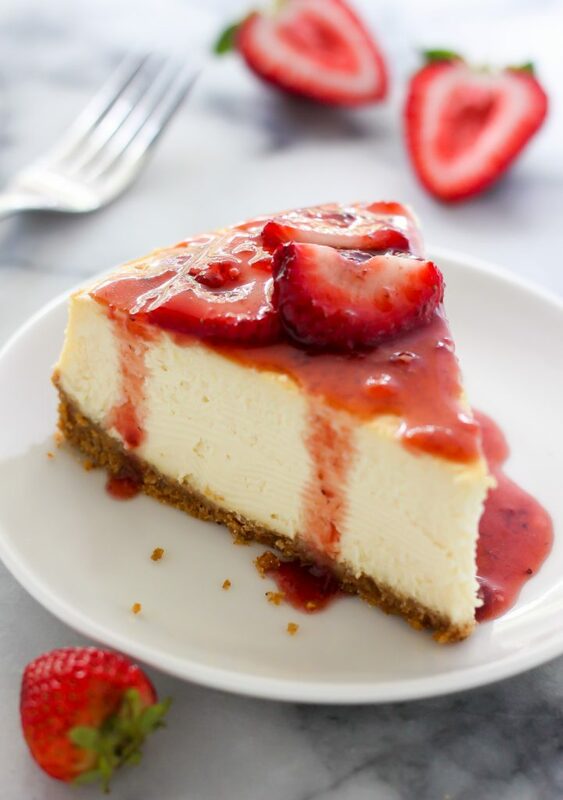 4) Before adding any of the additional ingredients to the cheesecake batter, be SURE the cream cheese and sour cream have been whipped to a completely silky smooth texture. You want to be sure that all of the lumps and bumps have been smoothed out so that the final result is utterly smooth and creamy. 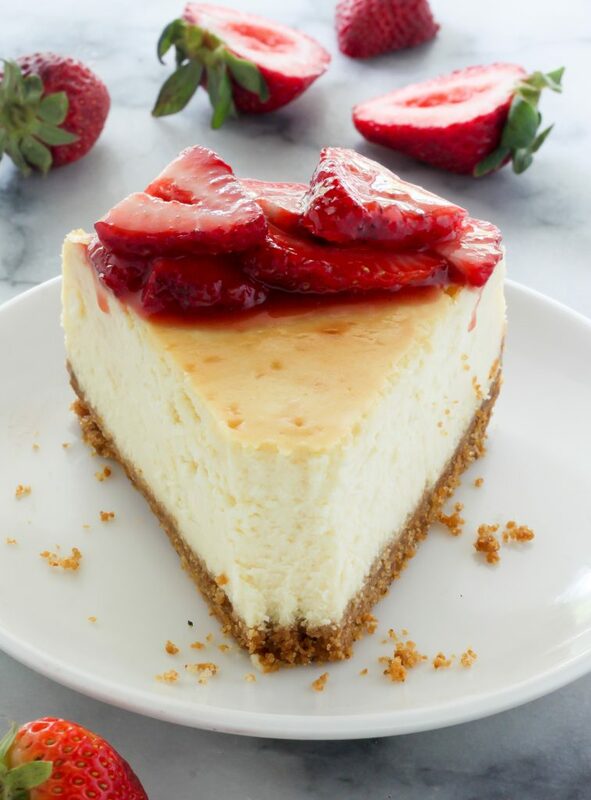 <—- Please pardon my overuse of the words “smooth” and “creamy” in this post 😉 But when it comes to cheesecake, those are the words we want. 5) Make a water bath. I promise; it’s not as scary as it sounds. The water bath helps the cheesecake stay nice and moist; it also ensures a crack-free pretty presentation. The best type of pan to use for a water bath is a roasting pan or any other large pan with sides at least 2 inches high. You need a pan with high edges so you can put enough water into the pan without it overflowing. 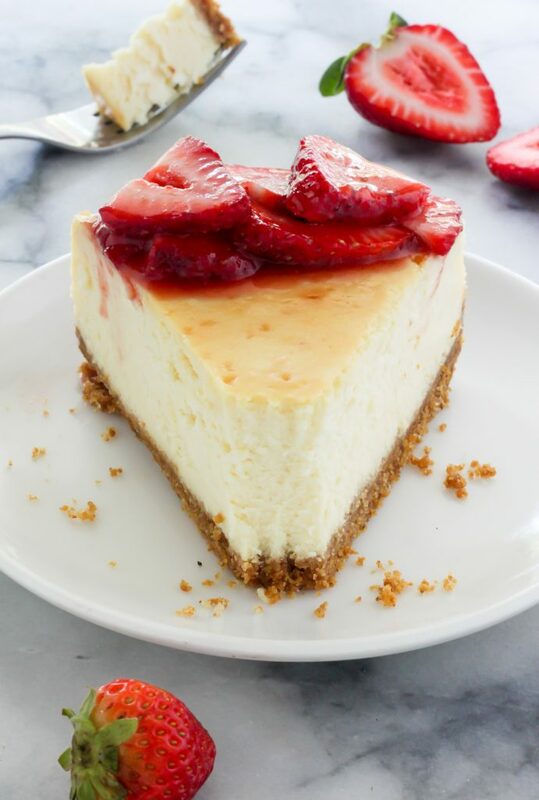 The best way to prepare a water bath is to place the cheesecake into the roasting pan, place the pan into the oven, and then – very carefully – add enough hot water to reach halfway up the pan. Since this recipe uses a spring form, you’ll need to wrap the pan first with aluminum foil to prevent water from coming through the bottom – no one wants a soggy crust! Use four or five sheets of foil in a crisscross pattern for best results. 6) Lastly, be sure to set an oven timer (or even just the alarm on your phone) for the exact bake time listed below. Over baking a cheesecake is, simply put, the easiest way to ruin a cheesecake. 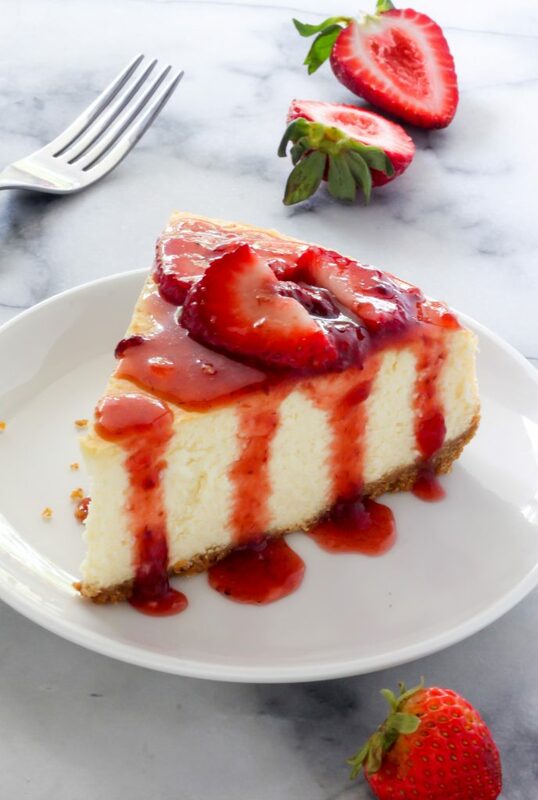 You’ll also want to set a timer once you shut the oven off, as this cheesecake cools inside the oven once the baking is completed. Lightly spray a 9" springform pan with non-stick spray; set aside. Quickly stir in the cream, mixing just until it's incorporated in the batter. 0 Response to "The Best New York-Style Cheesecake"